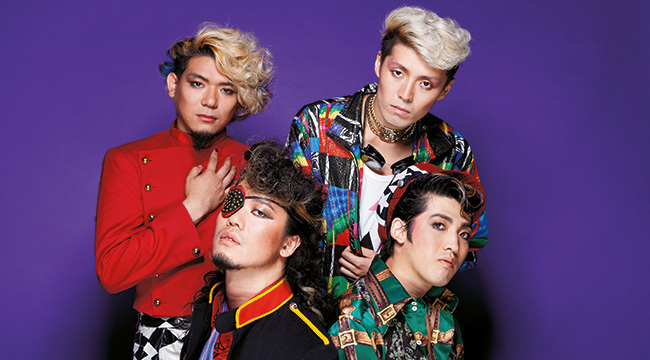 Poking relentless fun at Japan’s crassly commercial late 20th century pop culture against a backdrop of disco-infused postpunk, The Telephones have in eight years cut an increasingly large profile across the Japanese popscape. Metropolis talked to vocalist Akira Ishige about the Saitama band’s latest, Laugh, Cry, Sing… And Dance!! !, ahead of their Go Live Vol. 1 gig at Ex Theater Roppongi. The first time Metropolis saw the Telephones was some years back at Chelsea Hotel in Shibuya. How has your sound grown? These days we’re going for a more pop sound. Which is not to say out and out pop, but pop with an alternative flavor. We used to be more postpunk influenced. What is the band’s backstory anyway? We met at a live house in Saitama. My first thought was, can this really become a rock band? The members seemed too nice. I couldn’t believe it was going to work, but the first time we got in the studio it felt right. We didn’t start with a cover but wrote an original right away. Our first track had the disco punk sound typical of our early days. We actually still play the song—it’s called “Used Skin” off our Japan album. We still have the same members. We fight like any other band, but no one’s quit yet. We just hash it out until everyone has come to terms with whatever differences there are between us. Last summer you played your first Fuji Rock Festival. How was it? It was a dream come true. We were pretty nervous but psyched. Fuji Rock is a dream for any Japanese band. You feel like a star playing alongside all those international acts—it’s completely different than your typical Tokyo live house. Yeah, and the location is fantastic. We played the White Stage, which is beautiful and also has really good sound. What are some other events to aim for? It goes without saying that Glastonbury would be awesome and Coachella, too. Then there’s always the Fuji Rock Green stage. Have you been abroad yet? We’re going to Europe next month: France, Belgium, Switzerland and England. We’ll be playing with Polysics. We’ve gone in a melodic, pop-oriented direction. Was it a conscious choice? It was more of a natural tendency than a calculated decision. It was inspired by Eurobeat but done in a Telephones style. We love that kitschy, Eurobeat sound. It’s inspired by ’80s and ’90s electronic music, which is a huge influence on us. I go clubbing in Tokyo a lot and also DJ. I got into electronic music via the Manchester sound, beginning with bands like the Happy Mondays and New Order and then house and techno. What Tokyo clubs do you like? Ageha, WWW, Liquidroom are a few of my favorites. But I usually spin at smaller clubs in and around Shimokitazawa. I like to move between the live rock and electronic scenes, which have really been coming together anyway for the last seven or eight years. Actually there are still a lot of purely guitar-oriented bands. They may not be trendy at the moment, but there are many Japanese punk and metal bands that wouldn’t think of having anything electronic in the lineup. We’re recording a new song right now. It’s got a ’90s dance music vibe. I think you’ll find it interesting—it’s quite funny. Is humor important for you? Yeah, we always try to inject some humor into our songs. We’re pretty serious about music, and maybe as individuals, but when we get together something happens and we tend to lose it. Does humor make it easier to stick together as a band? We’re serious when we need to be serious, but we’re also serious about being funny, too… if you get what I mean. Who’s the goofiest band member? It’s hard to say. Everybody is funny in his or her own way. But maybe our synth player Nobu is the most obviously goofy. His stage persona reminds me a bit of The Happy Monday’s “Bez” [notorious dancer Mark “Bez” Berry]. Music has always been part of my life. It’s a release for me, whether listening to it or playing it. I started playing music in elementary school, and MTV was also a big influence. I was into hard rock and heavy metal even as a small child. It’s eight on a warmish—for January—Friday night in New York City, and the line is dozens deep for a set by Japanese trumpeter Takuya Kuroda at this year’s tenth Winter Jazz Fest. In a short decade, the event has become a fixture of New York’s music calendar, and tonight it’s something of a coming out party for Kuroda. The Kobe-born trumpeter is not only playing the sprawling festival on a Friday night at downtown club Groove, he’s also just launched his debut album for legendary label Blue Note. The aptly named Rising Son ripples with the 33-year-old Kuroda’s fluid style, and classic approach to chopsmanship. 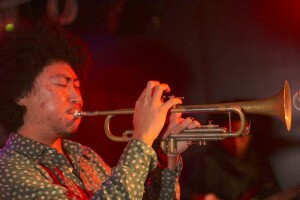 Best known until now as the trumpeter with nu soul vocalist Jose James, Kuroda is influenced in equal parts by the understated cool sounds of Miles Davis, and the more athletic, upbeat tones of Clifford Brown. Rising Son bubbles with beats from the laidback fusion of Roy Davis’s “Everybody Loves the Sunshine,” to Afrofunk, and at Groove the band is all rhythm. While the group could showboat if it wanted to, the players remain focused on, well, the groove. With Kuroda now on Blue Note, it’s only a matter of time before the New York-based player makes his mark on his native Japan. In the meantime, he’s boning up playing at events such as Winter Jazz Fest alongside the likes of Elliot Sharp, Vernon Reid, the Jazz Passengers, Marc Ribot and Roy Hargrove. Somehow, the image of three Chicano brothers singing rootsy rock songs steeped in Christian ideas of family and faith, didn’t seem quite the natural fit for Club Quattro in trendy, materialistic Shibuya. Not so long after a follow-up Fuji Rock appearance, their faith was severely tested. Singer and guitarist Henry broke his back at the beginning of 2013, falling off the stage during a concert in Los Angeles. Revelation sparkles with Los Lonely Boys’ “Texican rock ‘n’ roll,” their sublime blend of Latin rock, blues and Americana. It’s a style the brothers have been honing for a decade since they emerged out of Nashville, where they’d moved to break into music. 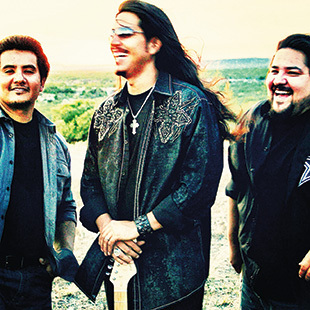 Los Lonely Boys’ new single, “Blame It On Love,” encapsulates the band’s musical trajectory. Launching with simple acoustic guitar and mariachi accordions, the track segues into a rollicking country rock jaunt, climaxing with a sizzling Fender guitar solo, all topped off with the brothers’ crystalline harmonies. The Japan-edition of Revelation, as is customary, features a few bonus tracks in the form of a cover of Santana’s legendary “Oye Como Va” and a live recording of “Heaven” from that night at Club Quattro. 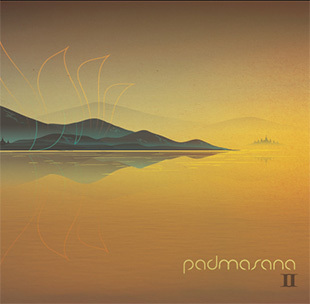 Almost a full generation since the first Western tripsters blissed out to sunrises on the Eastern beaches of Goa and Koh Phangan—and 13 years since their last album—Padmasana take up where they left off, providing the sonic downward glidepath for nights of electronic music and mind expansion. The duo of veteran Asia hands and occasional co-producers Gio Makyo and David Hikari (both at times Tokyo residents), with spiritual advisor S. Widi, expertly guide listeners on mood journeys via tracks such as “Transition” and “Vibration.” The musical references are as much to Indian ragas and Jamaican dub as they are a knowing wink to the 90s ambient house of The Orb or Subsurfing. The intriguing aspect of Padmasana 2.0 is that the music sounds good even without the presumed benefits of ecstasy or LSD. Is this because it brings the listener back to a certain time and place? Or because well-produced chillout music was always mind-expanding enough for it to stand alone?